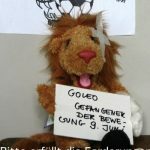 In 2006 artists Angelica Chio and Christine Kriegerowski faked the hijacking of Football World Championship mascot Goleo. The stuffed toy, a lion in a football shirt, became the star of a classical terrorists’ video which meticulously documented the amputation of its ear, and the rabbit cage in which it miserably waited for release. As FIFA didn’t react and there were only two minor articles in taz a video was published in which the hard-pressed mascot asks football officials to give in to the demands of its hijackers. Again FIFA failed to rescue Goleo, so he was condemned. Lovingly Chio and Kriegerowski documented various places where Goleo’s body was found and organised an exhibition at Stil und Bruch gallery in Admiralstraße, Berlin. Residents showed their compassion and spontaneously put up flowers and candles for the poor plush toy. On the occasion of the 10th recurrence of those dramatic events we can only join in the claims of the art terrorists: Be the protest generation, nothing gets better by itself.